The agenda for the next meeting of the Parish Council on 4th March is now on this website here. Members of the public are welcome to attend and there is a section for public participation at the start of the meeting, which is in the committee room of the Village Hall at 7.30pm. Both public participation and the actual Council meeting can only cover items on the agenda. Previous agendas and minutes of meetings can be found on the Agendas & Minutes page of the site, accessed via the bar menu. 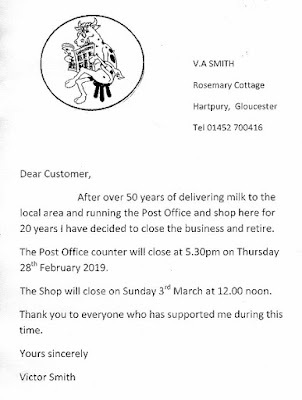 The closure of Hartpury Post Office will be a blow to many Maisemore residents who use it regularly. The Parish Council would like to thank Victor Smith and his team for providing such a valued service for so many years. As a consequence of the closure, Cotteswold Dairy - who have been supplying the milk to Hartpury Post Office - will be looking to expand their service in Maisemore, where they can deliver to your doorstep on six days a week. 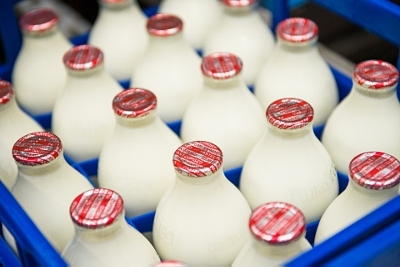 For those of us who are trying to cut down on single use plastic, there is some more good news in that Cotteswold will deliver full cream, semi-skimmed and skimmed milk in 'rinse and return' glass bottles. The Dairy can also deliver newspapers, bread and other products. If you would like to become a customer for doorstep delivery, you should contact Cotteswold Dairy on 01242 672426 or at cheltenhamretail@cotteswold-dairy.co.uk. Alternatively, go to their website - http://cotteswold-dairy.co.uk/ - and use the 'Become a customer' option. Please note that your web browser may give a warning message when you first use this site, but it is a genuine site and not a scam. This posting is provided for the information of residents and mention of any commercial organisation on the Parish Council website does not imply the Parish Council's endorsement or recommendation. Maisemore Village Hall commitee would like to host an open garden event on Sunday 9th June 2019 from 1-6pm. If you would be willing to open your garden would you please contact Carole Banks 07988 674236 or email carole.banks@maisemore-pc.org.uk. As well as providing teas at the hall we also hope to have a plant sale so any donations of plants would be appreciated. We have received a report of a telephone scam from people pretending to be from HMRC. They will state you owe tax and will instruct you to purchase Google Play vouchers. They will advise you what to say to the shop when you are purchasing the vouchers and then ask you to call them back with the voucher codes. This is a scam and if in doubt always call HMRC to check the call before taking any steps.